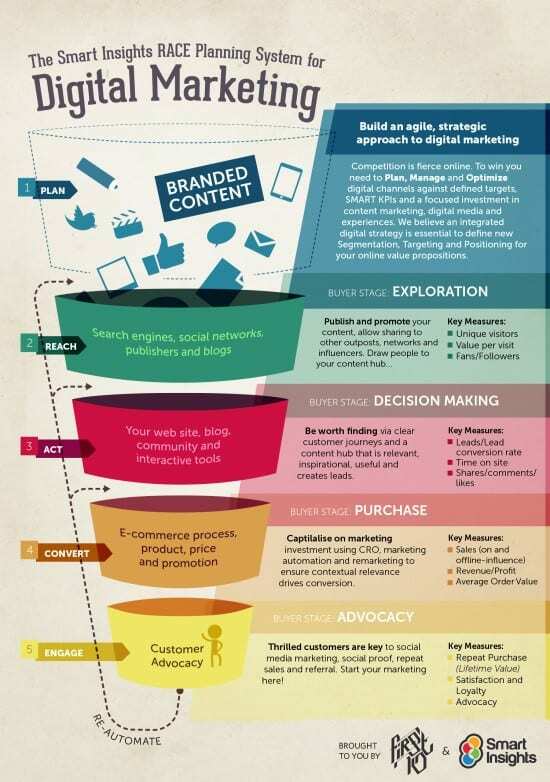 Is your digital marketing strategy weighing you down? I read some research by Pitney Bowes last year that highlighted how 87% of SMEs ignore the positive effect marketing can have and rather worryingly discovered that for some SMEs “buying office stationery” ranks as a higher priority than marketing and business strategy. Not only this, but the number of businesses who create a marketing plan and then never even implement one campaign or discard it after a few months helps towards British businesses losing £122Billion in sales every year. Apart from lack of money, which isn’t a reason in itself, two of the main reasons for the lack of marketing was cited as, not enough time and lack of discipline. I would suggest that both of these issues are caused by marketers creating over-complex plans that just aren’t sustainable and the lack of action could easily be alleviated by developing simple, easy to manage marketing strategies and campaigns instead. Here is a great tool to use when developing your digital marketing strategy and offered for free by Smart Insights. I first discovered this when training on a digital marketing course developed by Google. What does RACE stand for? There is also an initial phase of Plan involving creating the overall digital strategy, objective setting and plan, so sometimes people call it PRACE, but Smart Insights prefer RACE Planning for simplicity. That’s how I earned it too. Have you ever really thought about that before? Yet, it should probably be the first question you ask before even starting on the RACE plan. Simon Sinek talks about the Why and if you haven’t watched his Ted Talk you really must. He explains that the greatest leaders have all lead with a powerful Why at the core of What they do and How they do it. They don’t talk features and benefits, they sell a vision, a dream a new status quo. They zig when others zag and sell how your life will be that much better, cooler, more enjoyable and make you feel special. Clarity of why you do what you do. To have this, you need a purpose, cause or belief that exists above and beyond the products or services you sell. Discipline of how you do it. You must hold yourself and your people accountable to a defined set of guiding principles or values. Consistency of what you do. Everything you say and do must prove what you believe. Every product that Apple made, all their marketing always communicated the same message: Think Different. Whether you are already in business or just starting out you need to know where you are positioned today and where you want to be tomorrow. Of course you have a good idea of where that might be, but is that the same view as your target market? Research them and find out. There are two methods of market research that you can use depending on what you want to know which are qualitative and quantitative research. Qualitative marketing research obtains data from a relatively small group of respondents and is great for getting answers to very specific questions like your products and services. This differentiates it from quantitative marketing research, which requires a high volume of respondents and is more often used for statistical analysis. In 2014 we ran a quantitative survey to gain an understanding of how we were perceived by our target audience in the content marketing marketplace. Based on this we made some changes to our online presence and then went back to our target audience to see if we had re-positioned ourselves – in their eyes – to where we wanted to be. The total cost of this research was less than £100 in product plus quite a few hours of work getting it set up, running it and then working through the results. To stay ahead of the game you have to keep listening to what the market is demanding and where it is moving to. The only way to do that is through good market research asking the right questions. Automate your content marketing. It’s a digital world out there! It strikes me as strange when marketers and businesses suddenly become snobby at the idea of automating or outsourcing parts of their content marketing or digital marketing. I thought the whole idea of a computer was to get difficult and monotonous “stuff” done for us, fast. So, here are a few great tools that can help you automate your digital marketing campaigns and some outsourcing sites where you can find experts to do the work for you. WARNING: be very careful on the outsourcing sites. Vet the people who apply for work, make sure to do your due diligence and ask for references. Be careful the work they show you is actually their work and not copied. Set your project out in milestones and ONLY release your money when you have fully checked the work they supply. SocialBro: Get accurate information about your community, get to know your audience in-depth and interact efficiently with your contacts. Hootsuite: Manage social networks, schedule messages, engage your audiences, and measure ROI right from the dashboard. Tweepi: Join 500,000+ people who trust Tweepi for managing and growing their Twitter accounts. Simplycast: Marketing automation software that automates your marketing, including fax, SMS, voice, social media and email automation for your organisation. Percolate: From governance, planning and content creation to audience acquisition, social relationship management and analytics, Percolate unites your brand, your data and your stories across every team, location, and customer interaction. MailChimp: More than 7 million people and businesses around the world use MailChimp to send marketing emails, automated messages, and targeted campaigns. Elance: Where businesses go to find, hire, collaborate with and pay leading freelancers from more than 180 countries. Fiverr: A global online marketplace offering tasks and services, beginning at a cost of $5 per job performed, from which it gets its name. People per hour: A website and community through which freelancers across any number of sectors may apply or send a proposal for jobs that are posted on a fixed fee or per hour rate. Guru: Find 1.5 Million freelancers for hire in web development and programming, design and art, writing, sales and marketing, business, finance, legal and more. So, once you have your content marketing strategy in place you now have a few useful tools and extra hands to help you get those campaigns out on time, every time.